Instead of following the more traditional scientific poster format, the researchers decided to present their results using a schematic diagram of a tree. Resilience is the ability to function well both mentally and physically in the face of major challenges, such as coping with a disability. It is the product of both personal factors, such as age when disability occurs or having a positive attitude, and environmental factors, such as education level and available social support. The roots of the tree represent supports identified by the focus group participants: friends, family, agencies, and services. 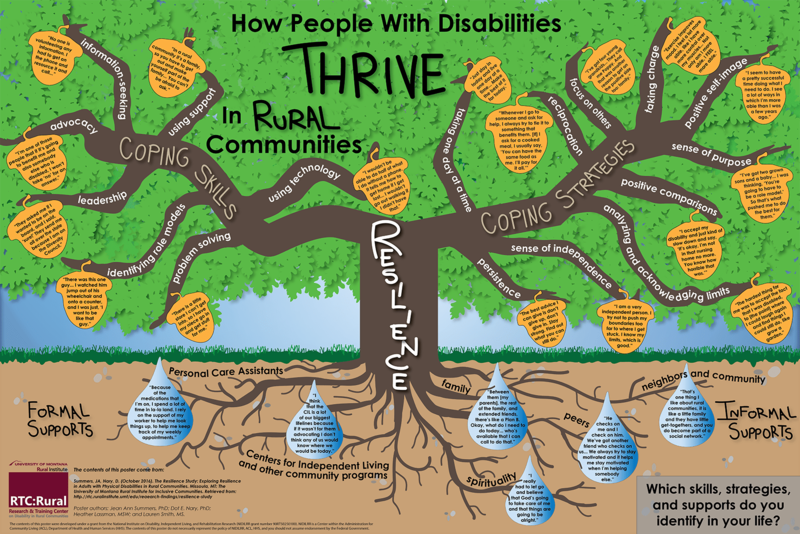 The branches of the tree represent what those roots supported: coping skills, such as problem-solving and advocacy; and strategies, such as positive attitudes and sense of purpose. The poster, one of five presented at the conference, prompted a number of conversations including ideas on how to use the poster as an interactive framework, using the poster as a guide to identify existing training programs that might build these coping skills and strategies, and brainstorming ways to increase opportunities to recruit supports. “Our poster was provocative in terms of stimulating conversation about what it might take to translate the experiences of these resilient people into training for those who need it,” said Dr. Summers. RTC:Rural and our partners value the opportunity to share ideas and spark conversations with our fellow NIDILRR grantees. If you are interested in receiving a printable file of the poster, contact Kerry Morse.